OMG IT'S FINALLY HERE!!! After waiting for a year and two months for this book it is finally here and it cannot be more glorious!!! This book picks up about a week after the events of Lady Midnight and let me just say that this book was just as mind blowing, plot twisting and heartbreaking as the first book, Lady Midnight. 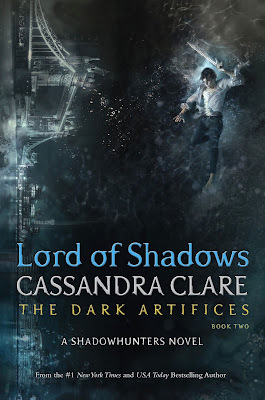 Usually i trilogies, the second book is sort of a let down but of course, with the queen Cassandra Clare that is never the case because this book is utterly mind blowing. The writing was beautiful and flawless as always and there were so many plot twists in this book I was at the edge of my seat the whole time! There is immense character growth in this book and things are so much more complicated than ever!!! And the freaking book cliffhanger! OMG. And we have to wait until 2019 for the next book to come out...I can't. I know she's releasing the first book of a new series next year but I honestly rather she would release the final book of this series first because THE FEELS. I did feel as if some parts of the book were a tad bit slow...like very few moments but they honestly didn't bother me that much! I love that in this book we got to see more of the Blackthorn siblings-Dru,Ty,Livvy and Tavvy and I was also super excited to see more of our lost (and now found) Herondale, Kit! Also, seeing characters from past series really made me nostalgic as I've been reading this series for four years now and I've been so invested in the series every since. Seeing Jace, Clary, Magnus and Alec again really made me happy:) But I would've liked to see more of Simon and Izzy of course. This series is very complex and very different from Cassie's past shadowhunter series such as the Mortal Instruments and The infernal Devices in that the problems or shall I say the climax of the book more and mostly with faeries. Faeries were so interesting and I really liked getting to see more of them and their nature! I am extremely worried as to how the events of the next book will be and how Cassie Clare will solve all the problems and weave everything out because everything is in such a complicated mess!!! Overall, I rate this book a 5/5 stars...as expected. This book/series is phenomenal and trust me, go read this book, you won't be disappointed. Now I'm just praying that 2019 will come soon enough:( (Cries).